I mentioned in my Best of 2012 post that the girls and are would be embarking on a “virtual” trip about the world. Well, we started our journey in the USA in the northernmost state, Alaska. My previous plan of a weekly schedule just wasn’t working out for us. So, while thinking of other options, I kept coming back to the idea of exploring the world. We’ve liked the previous projects we’ve done about world culture. I wanted to do more and I knew the girls would be interested as well. To prepare, I made both of the girls a passport. 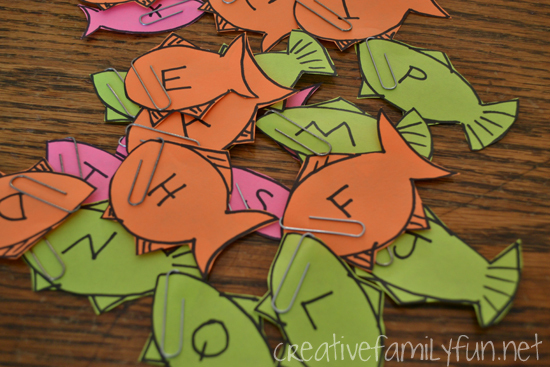 I used the tutorial I had previously published here. 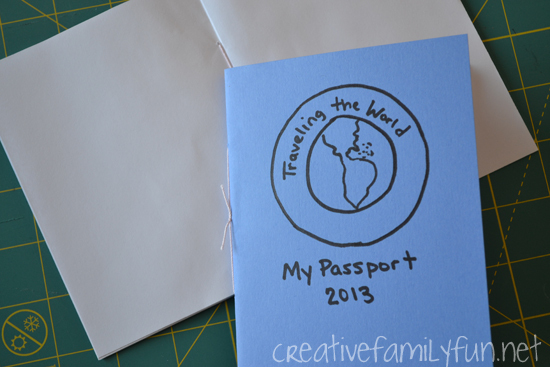 I kept things simple with blue card stock for the cover and white copy paper for the inside. For our stamps, I’m just going to draw a little design in a circle for each of our destinations. We started with a selection of books. 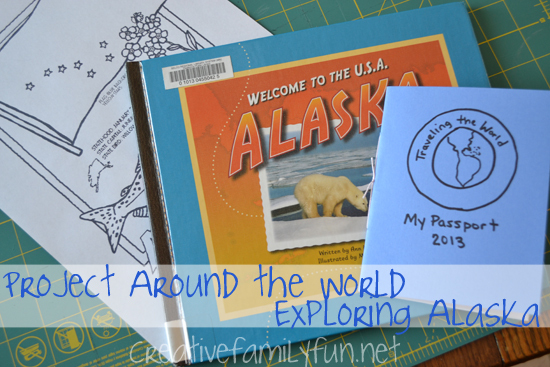 I used Alaska (Welcome to the U.S.A.) by Ann Heinrichs as our overview book. It hit all the high points and we used it as a travel guide. I decided on a few highlights from Alaska that we were going to visit, Denali National Park, the Iditarod Dog Sled Race, and an introduction to the Eskimo culture. The activities I had planned were not complicated. I know that if this project ever gets stressful, we’d quit. I want this to be fun, enjoyable, as well as being educational. So, how did I make it fun? We set up one of the girls’ little tents in our play room and turned it into a campsite. We’ve got sleeping bags and flashlights to add to the fun as we pretend to camp at Denali National Park. We’ve been reading books at our campsite and playing games, such as this fun ice fishing game I found at Joyfully Weary. We’ve been using the opportunity to practice writing, by making lists, and also practicing story telling. We’re still deep in the middle of our journey to Alaska and I hope to share more as we go along. We’ve created some beautiful artwork and also have a Creative Family Fun Night planned. You can find all the resources we use at Exploring Alaska: Resource Post. I love the idea of doing the activities in a tent to make it feel like a campsite! I can't wait to see the other activities you have planned for this series.